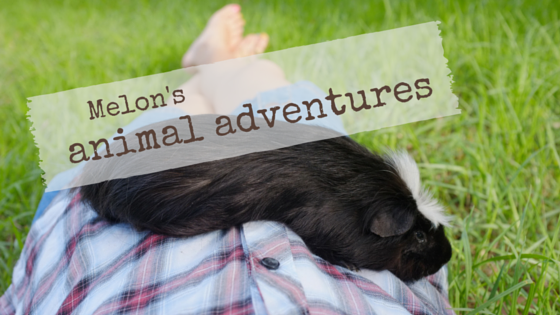 Melon's Animal Adventures: The Trial Run: Who Tells It Like It Is, Melon or Gatsby? The Trial Run: Who Tells It Like It Is, Melon or Gatsby? Very observant readers will be able to guess why I’ve been too busy to post this week, but before we get into that chapter of the story I should tell you first about Gatsby’s Trial Run! Gatsby stayed calm. Because of this, we humans could relax and enjoy the experience. This photo was taken from inside the house. Velcro dog outside? Check. Human inside? Check. Pigs flying? Check. Purely by chance, K’s brother dropped Gatsby off. This meant that Gatsby didn’t have to endure K – her one, her only, the light of her life, blah blah blah bark bark bark whine whine – bringing her somewhere and abandoning her to the oh so cold, empty world beyond and we didn’t have to endure the inevitable whining and carry-on! So she was calm (by Gatsby's standards, anyway) to begin with. I was super organised and arranged all the details before she arrived. I’m not saying this to toot my own horn, but to have a record here of things that can help me in future, and maybe help you guys too! Now, which things are we talking about? Well, let's do an analysis. Getting my white fur as brown as possible is hard work! My explanation: I took her out walking and playing for a good 3 hours as soon as she arrived before I deemed it safe to return home. Gatsby's explanation: Walk! Park! Mud! Yawn. Gatsby didn’t have one accident in my house. My explanation: I treated her like a puppy and took her out after every meal, as soon as we got up, right before bed, etc. Gatsby’s explanation: Doing business in the house like an uncivilised human? Gross! She didn’t destroy a single unsanctioned item. My explanation: I did some thorough de-cluttering to our totally un-dog-proof house to keep everything destroyable out of reach. Gatsby’s explanation: Destroy things? But I like it here. Gatsby didn’t end up anywhere she wasn’t supposed to be. My explanation: I bought second-hand baby gates and installed them to block off the kitchen and two carpeted areas.